Dual SMA Sunny Island 6048 120vac Inverters wired for 120/240vac. AC coupled. 2 6000 watt 48 volt inverters. 3 Phase SMA Sunny Island 6048 120vac Inverter. AC coupled. 3 - 6000 watt 48 volt inverters. 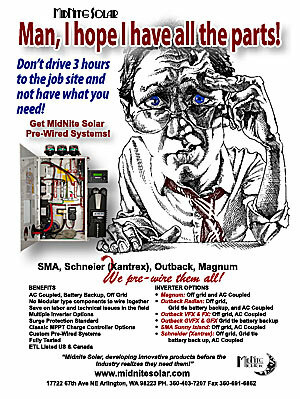 Quad SMA Sunny Island 6048 120vac Inverters wired for 120/240vac. AC coupled. 4 6000 watt 48 volt inverters.